Could Israel and Major Disasters and 'Terrorist Incidents' be Connected? https://www.youtube.com/watch?v=6eXlnvwBiKs Netanyahu does nothing for his reputation at the UN. Are western 'terrorist events' such as the Skripal poisoning and Florida school shooting organised and/or used to detract attention away from Israeli violence closer to home? Israel has launched what it described as a large-scale air raid in Syria after one of its F-16 fighters crashed while under Syrian anti-aircraft fire. The drone that entered Israeli airspace was shot down and retrieved. Russian airliner crashes south-east of Moscow, killing all 71 on board. Oxfam deputy director resigns over charity's failure to deal with sexual misconduct allegations in Haiti and Chad. Israeli Police report recommends Prime Minister Benjamin Netanyahu be prosecuted on bribery, fraud and breach-of-trust charges. Ex-student Nikolas Cruz guns down 17 people at Marjory Stoneman Douglas High School, Florida, before being captured. Israel is bombing #Gaza right now! Reminder: 2 million people live entrapped in Gaza. 1 million of them are children. Most already suffer from traumas from previous Israeli attacks. Prime Minister Benjamin Netanyahu, has made no secret of his detestation of Iran and what he sees as the threat posed by it. Given that Israel possesses over 300 nuclear weapons and an ability to deliver them in rockets and aeroplanes, its opposition to Iran becoming a nuclear power could be construed as somewhat hypocritical. More so when the recent military history of the two nations is compared, in which it is Israel that has taken a far more aggressive and interventionist approach, both on its own territory and on others. Israel's public position regarding Iran is mirrored by the USA with which it has a saprophytic - some would say parasitic - relationship. America, despite being hugely in debt itself, supports it financially to the tune of over three billion dollars ($3,000,000,000) a year, plus additional military 'sweet deals' and other political and intelligence assistance. It has been said that America regards Israel as its 'aircraft carrier' in the Middle East and it is hard to put a cigarette paper between the foreign policy objects of both that have been hugely damaging to neighbouring countries and to the stability of the world. Although promising a new approach, President Trump has demonstrated he is no different from previous administrations in this regard, having already announced his intention to move the American Embassy to Jerusalem as a tacit indication he regards it as the Capital of Israel, and of slavishly blaming the Palestinians for the failure to reach a peaceful settlement. His recent appointment of John Bolton, a recognised and vociferous 'friend of Israel', as National Security Advisor is further confirmation, if confirmation were needed, that Trump's administration is in the palm of Zionists. Of course this ignores both history and international law and is in fact a travesty of the truth that Israel has skillfully promulgated since Jewish refugees arrived in the territory and founded, with United Nations approval, "the State of Israel" in 1948. With brutal determination it has extended its occupation, progressively excluding the people with a preceding right to be there from the benefits of a subsidised economy. Jerusalem has been systematically and persistently subject to ethnic cleansing, first in the western part of the city and then from 1957 in the Eastern part, which continues to this day. Meanwhile a brutal policy of harassment and isolation has been imposed on both the West Bank and Gaza, virtually ignored by the 'very ethical' western nations. Thus 2018 is a significant year, marking seventy years since its creation, apparently to be marked by celebrations, including it has been announced a visit by British Prince William of Wales. Whether the Palestinians who he is also intent on visiting and their dispossessed countrymen who presumably he will not see, will be celebrating quite as much as their Jewish counterparts can only be imagined. Let us hope it doesn't turn into an Royal seal of approval for all the country's misdeeds that continue on a daily basis, or yet another 'slap in the face' for those that have been abused and mistreated for so long. Will Americans die in fighting Israel's battles? In its seventy years Israel has effectively managed to persuade America to fight its battles for it and to provide political and practical support when it engages in its own aggressive action, as in the 2008 and 2014 attacks on blockaded Gaza. "The commander of American military forces in Europe on Sunday pledged to support the Israel Defense Forces in times of crisis. He was visiting the army’s Tel Aviv headquarters, during a joint US-Israel missile defense exercise, known as Juniper Cobra. “The US is deeply committed to the defense of Israel. 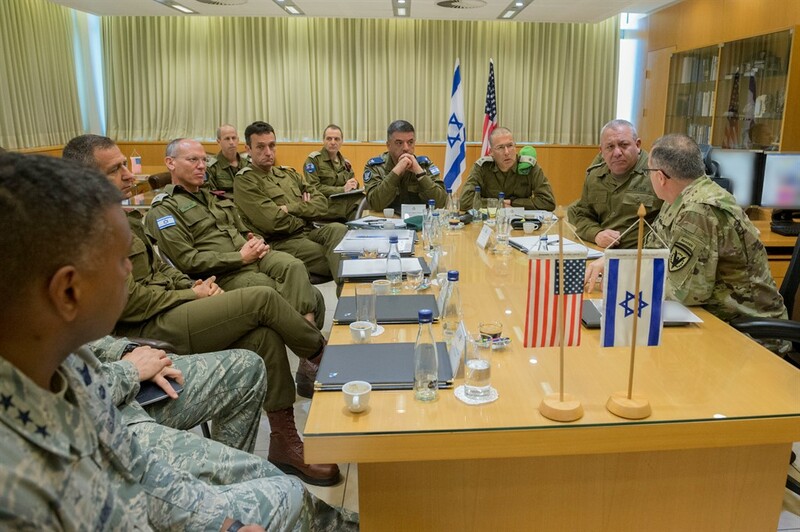 We will continue to work alongside the IDF to promote stability throughout the region, not only for the purposes of this exercise, but in the event of any real-world contingency,” said Commander of the European Command (EUCOM) Gen. Curtis Scaparrotti." “For more than four weeks, they will train shoulder to shoulder, the same as we would fight in times of crisis. It’s not just about an exercise,” Brig. Gen. Tzvika Haimovitch, Israel’s air defense commander, told reporters last Thursday." "Not all of the 2,500 US troops taking part in Juniper Cobra are physically present in Israel; a portion of them are participating from American bases in the United States and EUCOM’s base in Germany, US officials said." This is a master stroke, as it provides Israel with the strategic advantages at virtually no cost to itself. A foreign country bears the financial and human cost in soldiers killed. There is now no doubt that the demolition of neighbouring countries was hatched as a Zionist/Neo-Con plan contingent upon the 'Pearl Harbour Event' of 9/11, in which agents of Israel have been proved to have been deeply involved. In normal circumstances this would and should have caused enormous back-lash against Israel, but by careful manipulation and cover-up, to the eternal shame of American institutions, this did not occur, and the fraudulent relationship continues. Michael Arthur Ledeen (born August 1, 1941) is a prominent Jewish/American historian, philosopher and neoconservative and has been a long time and active supporter of political dissidents, particularly Iranians. In 1980 he wrote a series of articles smearing Jimmy Carter's brother, linking him to Muammar al Gaddafi and Yasser Arafat which were later proved to be disinformation. He was paid $120.000 by Italian secret service organisation SISMI, probably as a CIA/NATO front, which at that time was deeply involved in the GLADIO false flag operation focusing on Italy in particular. Throughout the 1980's he made no secret of his links with the CIA and Israeli intelligence and was deeply involved in the Iran/Contra affair in which the CIA used huge amounts of drug money to fund Central American guerrillas. In 2002 Ledeen wrote, "He (Brent Scowcroft) fears that if we attack Iraq "I think we could have an explosion in the Middle East. It could turn the whole region into a cauldron and destroy the War on Terror." "One can only hope that we turn the region into a cauldron, and faster, please. If ever there were a region that richly deserved being cauldronized, it is the Middle East today. If we wage the war effectively, we will bring down the terror regimes in Iraq, Iran, and Syria, and either bring down the Saudi monarchy or force it to abandon its global assembly line to indoctrinate young terrorists. That's our mission in the war against terror." British subservience to American Zionist policy? So it seems clear Ledeen's philosophy and pronouncements, essentially those of the Jewish Israeli State and international supporters has found practical expression in both the foreign and domestic policy of the west including Britain. It is important we realise that events are not as we are informed, just isolated and anarchic, but are in fact planned and coordinated to create fear and to destabilise the political order. It couldn't be clearer that in both America and Europe it has been successful. We should realise this is a Zionist plan and philosophy that we see acted out on an almost daily basis before our eyes, particularly as regards Syria, Iran and Russia, yet people are blind as to its true purpose and originators. Israel the Terrorist State - yet never suspected of masterminding terrorism! First we need to establish the FACT that Israel and its acolytes have engaged in acts of terrorism designed to focus blame on others, that support their claim to victim hood and a common enemy be it Alquaeda, Islamic State, ISIS, Daesh, Taleban, Sadam Hussein, Gadaffi, Arafat, Assad, Iran, Russia or whatever. Only recently we have had both the British Minister of Defence and a leading General ludicrously bigging up the Russian threat now that ironically ISIS has been defeated by Russian action. Nor should we overlook the militarisation and over-reaction of Western policing as an intentional parallel domestic policy objective. The two are related and promoted by 'acts of terrorism' that almost invariably evidence links with Israel and/or state Secret Services. Terrorism is deeply embedded in the Israeli state, which has proved foreign territory is no barrier to it, yet as in the Skripal case, the possibility of a nation other than Russia being responsible, is not even entertained. It is well known that Israel was founded on an act of terrorism when the King David Hotel in Jerusalem was blown up by Irgun zealots, killing ninety-one largely innocent people in 1946. The newly founded state in 1948 had idealistic objectives and faced off these groups and individuals but it was these that eventually gained political control of the state. It should not come as a great surprise therefore if their philosophy and methods should translate into a state enterprise directed against anyone or thing considered to be threat to its existence. Even under the respectable leadership of Golda Meir, following the 1972 attack at the Munich Olympic Games, a top secret campaign of assassination was instituted of targets that lasted for over twenty years. Wikipedia here: https://en.wikipedia.org/wiki/List_of_Israeli_assassinations lists the victims of this state policy. It is also clear that any ethical reservations have been abandoned and the number of victims have increased with passage of time. With very little international opprobrium, Israel has undoubtedly become the principal Assassination State! This disgraceful event in which up to 3,500 Lebanese and Palestinian civilians were slaughtered by the Phalange 'Christian' militia virtually under the eyes of their Israeli allies under the control of none other than a future Prime Minister Ariel Sharon (2001 - 2006)! From Wikipedia: "According to Alain Menargues, the direct perpetrators of the killings were the "Young Men", a gang recruited by Elie Hobeika, a prominent figure in the Phalanges, the Lebanese Forces intelligence chief and liaison officer with Mossad, The Kahan Commission concluded Israeli Defense minister Ariel Sharon bears personal responsibility "for ignoring the danger of bloodshed and revenge" and "not taking appropriate measures to prevent bloodshed". Sharon's negligence in protecting the civilian population of Beirut, which had come under Israeli control, amounted to a non-fulfillment of a duty with which the Defense Minister was charged, and it was recommended that Sharon be dismissed as Defense Minister. At first, Sharon refused to resign, and Begin refused to fire him. It was only after the death of Emil Grunzweig after a grenade was tossed by a right-wing Israeli into the dispersing crowd of a Peace Now protest march, which also injured ten others, that a compromise was reached: Sharon would resign as Defense Minister, but remain in the Cabinet as a minister without portfolio. Notwithstanding the dissuading conclusions of the Kahan report, Sharon would later become Prime Minister of Israel." Assassination become an established Israeli policy! Assassination, has particularly in recent years, become an established and recognised tool of the Israeli State, yet strangely gets away with it on the international scene, so effective has its propaganda of victim hood been. Yet nothing can disguise the fact that its is the world's premier non-judicial killing machine. It is then hardly a great leap of imagination that is required to consider it possible that Israel has been behind or involved in recent terrorism in Europe and America, especially if Israel has benefited from them, as undoubtedly it has, and if factual evidence exists that link them to the crime. Given the very close relationship between American and British secret organisations such as the FBI, CIA, MI5 and MI6 with MOSSAD, it is not hard to postulate a possible connection in the planning and execution of acts of terror. Yet as in the Skripal case, this is not even considered a remote possibility. How can Britain and Britons be so blind to the facts? Ukrainian-Jewish immigrants and was raised in a Labor Zionist household. As a teenager he joined the Palmach, the commando force of the Yishuv. He eventually rose through its ranks to become its chief of operations during Israel's War of Independence. Rabin was Israel's minister of defense for much of the 1980s, including during the outbreak of the First Intifada. Assassinated 1995. The gunman Yigal Amir, a Jewish Israeli student, was apprehended within seconds by people in the crowd. Rabin died later on the operating table of Ichilov Hospital. Amir confessed to the assassination of Rabin. was the leader of the Zionist militant group Irgun, the Revisionist breakaway from the larger Jewish paramilitary organization Haganah. He proclaimed a revolt, on 1 February 1944, against the British mandatory government, which was opposed by the Jewish Agency. As head of the Irgun, he targeted the British in Palestine. Later, the Irgun fought the Arabs during the 1947–48 Civil War in Mandatory Palestine. Jewish village of Ruzhany, Grodno province,Russian Empire (now Belarus),As a youth he joined Betar, the Revisionist Zionist youth movementShamir joined the Irgun Zvai Leumi, a Zionist paramilitary group that opposed British control of Palestine. When the Irgun split in 1940, Shamir joined the more militant faction Lehi, also known as the Stern Gang, headed by Avraham Stern. [In 1943, he became one of the three leaders of the group, serving with Nathan Yellin-Mor and Israel Eldad. Shamir sought to emulate the anti-British struggle of the Irish Republicans and took the nickname "Michael" after Irish Republican leader Michael Collins. Shamir plotted the 1944 assassination of Lord Moyne, British Minister for Middle East Affairs, and personally selected Eliyahu Hakim and Eliyahu Bet-Zuri to carry it out. was born Szymon Perski, on August 2, 1923, in Wiszniew, Poland (now Vishnyeva, Belarus In 1947, Peres joined the Haganah, the predecessor of the Israel Defense Forces. David Ben-Gurion made him responsible for personnel and arms purchases; he was appointed to head the naval service when Israel received independence in 1948.In 1952, he was appointed Deputy Director-General of the Ministry of Defense, and the following year, he became Director-General. At age 29, he was the youngest person to hold this position. He was involved in arms purchases and establishing strategic alliances that were important for the State of Israel. He was instrumental in establishing close relations with France, securing massive amounts of quality arms that, in turn, helped to tip the balance of power in the regionFrom 1954, as Director-General of the Ministry of Defense, Peres was involved in the planning of the 1956 Suez War, in partnership with France and Britain. Peres was sent by David Ben-Gurion to Paris, where he held secret meetings with the French government. Peres was instrumental in negotiating the Franco-Israeli agreement for a military offensive. born in 1949 in Tel Aviv, Israel, to an Israeli-born mother, Tzila Segal (28 August 1912 – 31 January 2000) and a Warsaw-born father, Prof. Benzion Netanyahu (1910–2012) He joined the Israel Defense Forces shortly after the Six-Day War in 1967, and became a team leader in the Sayeret Matkal special forces unit. Netanyahu took part in many missions, including Operation Inferno (1968), Operation Gift (1968) and Operation Isotope (1972), during which he was shot in the shoulder. Netanyahu fought on the front lines in the War of Attrition and the Yom Kippur War in 1973, taking part in special forces raids along the Suez Canal, and then leading a commando assault deep into Syrian territory. In 1973 he While there, he fought in special forces raids along the Suez Canal against the Egyptian forces, before leading a commando attack deep inside Syrian territory, whose mission remains classified today. Between 1978 and 1980 he ran the Jonathan Netanyahu Anti-Terror Institute. He is famously quoted as saying that "9/11 was good for Israel". His paternal grandparents, Frieda and Reuven Brog, were murdered in Pušalotas (Pushelat) in the northern Lithuania (then ruled by Russian Empire) in 1912, leaving his father orphaned at the age of two. Barak's maternal grandparents, Elka and Shmuel Godin, died at the Treblinka extermination camp during the Holocaust. He previously held the posts of Minister of Defense and Deputy Prime Minister in Benjamin Netanyahu's second government from 2009 to 2013. He is the joint most highly decorated soldier in Israel's history, having taken part in many battles and combat missions. According to Olmert, his parents, Bella (Wagman) and Mordechai Olmert, escaped "persecution in Ukraine and Russia, and found sanctuary in Harbin, China. They emigrated to Israel to fulfill their dream of building a Jewish and democratic state living in peace in the land of our ancestors." His father later became a member of the Knesset for Herut. Olmert's childhood included membership in the Beitar Youth Organization and dealing with the fact that his parents were often blacklisted and alienated due to their affiliation with the Jewish militia group the Irgun. After serving as PM he was sentenced to serve a prison term over convictions for accepting bribes and for obstruction of justice during his terms as mayor of Jerusalem and as trade minister. Olmert and Minister of Defense Amir Peretzwere heavily criticized for their handling of the 2006 Lebanon War. In late 2008, a ceasefire between Hamas and Israel ended, which led to the 2008 Israel-Gaza conflict. Olmert declared that the Israeli Defense Force would target the Hamas leadership and infrastructure in the war. As a relevant aside, it was this man who was secretly in New York on the day in 2001 when the Twin Towers were targeted by terrorist planes. On Sunday, February 18th, Flight No. 3704 of Aseman Airlines, Iran's 3rd airline company with a fleet of 29 planes, left Tehran's Mehrabad International Airport at 8:03 am local time, heading for Yasuj. The plane, with 66 aboard, including six crew, never reached its destination, crashing into a mountainous region near the town of Semirom, close to Isfahan, south-central Iran. One family member of a crash victim was seen weeping and saying she was at the mountain and no rescue team was sent. They called from the crash site and said we are alive, she added. A family member of the recent #IranPlaneCrash victims desperately cries and says she was at the mountain & no rescue team was there. When is Israel most likely to use nukes? See "Sunspot Cycles and Activist Strategy"
1949: French and Israel atomic researchers start to exchange information. Israeli Defence Force Science Corps begins two year geological survey of the Negev desert in search of recoverable Uranium. 1952: Israeli Atomic Energy Commission is created. Its chairman, Ernst David Bergmann of Israel's Weizman Institute of Science, "the father of Israel's bomb," has been promoting nuclear armed missiles for Israel since arriving after World War II. Newly elected President Eisenhower will refuse to sell arms to Israel during his two terms, ending in 1960. France sells them to Israel from 1955 to 1967. Israeli nuclear plant at Dimona, top. Mordechai Vanunu photo bottom. More Vanunu photos from inside Dimona here. 1955: Under Atoms for Peace program, overseen by pro-Israel Lewis Stauss who was head of America's Atomic Energy Commission, U.S. helps fund a small Israeli nuclear research reactor. Strauss learned about Dimona and its purpose before the U.S. government but did not inform the U.S. government. 1956: France and Israel formally and secretly agree to build a nuclear reactor in the Negev desert. Britain, France and Israel invade Egypt (Suez Canal crisis) and the Soviet Union threatens to use rockets against them if they do not desist, leading to a cease-fire. U.S. begins U-2 spy flights over targets world wide, including Israel. 1957: France and Israel sign a revised agreement calling for France to build a 24 MWt reactor; unwritten was the agreement to build a plutonium reprocessing plant. 1958: Israel breaks ground at Dimona, with assistance of French scientists and contractors, and U-2 spy planes provide evidence Israelis are building nuclear plant there. 1960: Israeli scientists witness first French atomic explosion in South Pacific. French President Charles DeGaulle threatens to cut off reactor fuel if Israel doesn't accept international inspections, but eventually accepts Israel's assertions Dimona is only for peaceful purposes and work continues. United States intelligence leaks to the press that Israel is building a secret nuclear facility that will eventually produce a nuclear bomb. Israel admits this to its Parliament and world but claims it is only for peaceful purposes. 1961: President Kennedy makes the man who leaked Israel's bomb to the press head of the CIA. Kennedy is very opposed to Israel having the bomb and tells Israeli Prime Minister Ben-Gurion so in many letters and in meeting in New York about the purpose of Dimona. Ben-Gurion tells him its purpose is peaceful and refuses to allow international inspections. Israel launches its first rocket. 1962: Ben-Gurion allows inspections by American inspectors only in return for sales of Hawk surface-to-air missiles. Israel builds a fake control room and bricks off parts of buildings to hide from inspectors the true size and purpose of the reactor (three times bigger than admitted) and that it was connected to a plutonium reprocessing plant; this feint continues during seven such inspections until they end in 1969. Reactor at Dimona goes into operation. 1964: Dimona plutonium processing plant goes online. In first official visit by an Israeli Prime Minister (Eshkol) to Washington, Johnson promises Israel offensive fighter jets and other weapons if it refrains from producing nuclear weapons. Israel's Eshkol eventually agrees to Johnson's terms and holds off on producing the bomb for a few years. China explodes first nuclear bomb. 1965: Israel performs its first plutonium extraction, and France assists Israel in developing its Jericho missiles. 1966: U.S. begins fighter jet and arms shipments to Israel. Johnson discourages further reports on Israel nuclear situation from U.S. embassy in Israel. Israel refuses money for nuclear desalination plant which is tied to international inspections of Dimona. 1967: Six Day War when Israel pre-emptively attacks an Egyptian military buildup in the Sinai Peninsula. Israel attacks USS Liberty surveillance vessel, killing 34 sailors; (see BBC allegation below that Israelis wanted to instigate a U.S. nuclear attack on Cairo). Soviet Union supports Arabs militarily, sends ships to the region and breaks diplomatic ties with Israel. Americans unofficially inform Israel that the Soviet Union has put four Israeli cities on its nuclear target list. 1968: Defense Minister Moshe Dayan, believing Israel cannot depend on the U.S. to defend it, unilaterally orders full production of nuclear weapons, averaging four to twelve per year, depending on size. Israel illicitly imports two hundred tons of uranium. 1969: President Richard Nixon takes office and fully supports Israel's nuclear weapons, as does his National Security chief Henry Kissinger. Ends American inspections at Dimona and shares some nuclear targeting information about the Soviet Union. CIA tries to inform President Johnson about Dimona, but he brushes off information, signs Nonproliferation Treaty, and sends Israel advanced Phantom fighter jets. 1973: Israelis catch Soviet spy ring in high levels of Israeli government and make it clear to Soviets they have produced "suitcase nukes" they could sneak into Russia. Egypt and Syria attack unprepared Israeli forces in Sinai and Golan Heights on the Jewish fast in Yom Kippur War. Israel goes on nuclear alert and begins to ready nuclear weapons for actual use, forcing the U.S. to airlift them weapons and to start redeploying nuclear armed ships and airplanes. When Soviets started talking about sending in Russian troops, Israel again goes on nuclear alert. Washington pressures Israel to accept a cease-fire. 1974: Defense Minister Dayan visits South Africa to discuss testing a nuclear weapon there. 1975: Israel receives nuclear-capable Lance missiles from the United States, even as U.S. remains in official denial about Israel having nuclear weapons. 1976: South Africa's Prime Minister visits Israel to sign several nuclear and other agreements. 1977: Menachem Begin's right wing expansionist Likud Party takes power in Israel and is determined to reshape Middle East to suit Israel's needs, including through using the nuclear threat. Commits to nuclear targeting of even more cities in the Soviet Union. President Carter does not take on the issue, despite conducting Camp David peace talks between Egypt and Israel. 1979: President Carter provides Israel ability to see American spy satellite photos for defense purposes only, but Israelis manage to get them for pre-emptive strikes against Middle East and Russia. Israel and South Africa explode first nuclear bomb in South Indian Ocean but appointed U.S. committee refuses to conclude it was a nuclear explosion. 1981: Israel, using U.S. spy satellite photos, sends F-16s to bomb and destroy Iraqi nuclear reactor under construction at Osirak. U.S. strictly limits further access to spy photos. Defense Minister Ariel Sharon recruits American Navy employee Jonathan Pollard as a spy to obtain satellite photos plus massive amounts of other classified information about Israel's enemies, some of which Israel turns over to the Soviet Union to try to win over its adversary. Ariel Sharon talks President Reagan into a formal Israel-U.S. military alliance against the Soviet Union but Defense Chief Weinberger delays and sabotages it. 1982: Under Ariel Sharon's military leadership, Israel invades Lebanon to attack Palestinian militants as first part of plan to drive Palestinians into Jordan, using the threat of nuclear weapons to intimidate any adversaries. However, despite destroying Beruit and killing more than ten thousand Arabs and 500 Israelis, Sharon's efforts in Lebanon fail. Israel eventually withdraws and Sharon loses his position. 1985: Jonathan Pollard captured leaving office with stolen papers. Eventually sentenced to life in prison. 1986: Mordechai Vanunu, a disaffected Dimona technician who left with photographs and other evidence of nuclear weapons production, publishes details in the London Sunday Times newspaper; reveals Israel has over 100 nuclear weapons. Israel starts disinformation campaign then lures him to Italy where he is kidnaped, taken to Israel and imprisoned for 18 years. He was released in spring of 2004 and remains under house arrest because of his continuing contact with the media. 1987: Israel test-fires a Jericho 2 missile capable of carrying a nulcear weapon. UN General Assembly and the IAEA General Conference passes first of more than a dozen resolutions calling on Israel to join the Nonproliferation Treaty. 1988: Israel launches its first spy satellite into orbit. 1991: U.S. convinces Israel to refrain from attacking Iraq with nuclear weapons, even if Iraq uses chemical or biological weapons against it, but Israel's nuclear weapons remain on alert. 1999: US Department of Energy document ranks Israel sixth among countries with nuclear weapons. 2000: Knesset debates Israel's nuclear weapons program for first time. Germany sells Israel three state-of-the-art 800-class Dolphin submarines and Israel tests first submarine-launched missile in the area of the Indian Ocean. Ariel Sharon is elected Prime Minister of Israel, still intending to use nuclear weapons to bully other nations and remake the Middle East for the benefit of Israel. George Bush is elected in the United state and his neoconservative allies fully intend that the United States help Sharon fulfill that mission. Right wing Israelis begin freely talking about attacking other nations, including with nuclear weapons. 2001: Bush inflames Arabs by clearly taking sides with Israel's expansionist aims, part of the reason for the September 11 attacks against the Pentagon and the World Trade Center. He obsesses about attacking Iraq, not defending America against known Al Queda terrorists. Starts planning war against Iraq after September 11 attacks, including option of using nuclear weapons. 2002: George Bush gives Israel the go-ahead to use nuclear weapons against Iraq if Saddam attacks Israel before the American invasion of Iraq. Pentagon Office of Special Plans uses information from Iraqi dissidents and Israel's Mossad to convince Americans that Iraq has weapons of mass destruction that are an imminent threat against America. Israel launches Ofek-5 satellite with a powerful new inter-continental missile. 2003: Israel repeatedly demands sanctions against Iran for its nuclear program and threatens to bomb Iran's operating nuclear power plant, despite Iran's threats to retaliate hard against Israel. Russia may have sold Iran additional advanced missiles capable of shooting down Israeli bomber and fighter jets. Russian President Putin proposes Security Council formally call for establishment of a Palestinian state and arrests last of the Jewish "oligarchs" who bought state industries for pennies on the dollar under Yeltsin. Arab and other nations repeatedly ask that Israel nuclear facilities come under international inspections. So does the head of the International Atomic Energy Agency (IAEA) Mohammed el-Baradei. United Nations General Assembly passes resolution that Israel join the nonproliferation treaty by a vote of 164-4. Prime Minister Ariel Sharon tells Israeli newspaper that Israel will not dismantle its “special measures” because the U.S. will not remain in the Middle East forever. 2004: Israel buys two more German submarines for delivering nuclear tipped cruise missiles, making a total of five. Mordechai Vanunu's prison term ends 2004 but Israel keeps putting him in prison and or under house arrest for trying to speak to others outside the country on nuclear issues and for wanting to leave Israel permanently. The phrase the “Samson Option” is used to describe Israel’s strategy of massive nuclear retaliation against “enemy” nations should its existence as a Jewish state be jeopardized through military attack. Israeli leaders created the term in the mid-1960s, inspired by the Biblical figure Samson, who destroyed a Philistine temple, killing himself and thousands of Philistine enemies.Israel refuses to admit officially that it has nuclear weapons - a policy known as “nuclear ambiguity” or "nuclear opacity." This despite government officials inferring repeatedly - and occasionally admitting - the fact. And despite Israeli nuclear whistle blower Mordechai Vanunu making public smuggled photographs of nuclear weapons and production equipment in the 1980s. Israel now may have as many as 400 atomic and hydrogen nuclear weapons, as well as the ability to launch them via long range missiles, submarines and aircraft. It can use them in a second strike even if its military is devastated.Originally a strategy of last resort retaliation - even if it means Israel’s annihilation - it has developed into being a nuclear bullying strategy to further Israel’s territorial goals through threats and blackmail. Israel has bullied not only Arab and Muslim nations, but the United States and Russia with its Samson Option threats. Mordechai Vanunu has alleged that Israel uses for purposes of blackmail its ability to "bombard any city all over the world, and not only those in Europe but also those in the United States." During the 1960s Israel concentrated on conventional military superiority to defend lands confiscated in the 1948 and 1967 wars - and to convince Palestinians in Israel and the occupied territories that they could not break free of it. However, in 1973's Yom Kippur War Israel was almost overwhelmed by Arab forces. Prime Minister Golda Meir authorized a nuclear alert, ordering 13 atomic bombs be prepared for missiles and aircraft. Israeli Ambassador to the U.S. Simha Dinitz threatened “very serious conclusions" if there was not an immediate airlift of supplies. This forced U.S. President Richard Nixon to make emergency airlifts of state of the art military supplies to Israel. Fearing intervention by the Soviet Union, U.S. forces went on Defense Condition (DEFCON) III alert status, something which could have led to full scale nuclear war in case of misinterpretation of signals or hardware or software failures. Additionally, as Seymour Hersh documents in detail in his book The Samson Option, from 1973 these weapons have been used to discourage the Soviet Union - now Russia - from intervening militarily on behalf of Arab nations. Obviously an Israeli nuclear attack on Russia by the United States’ great ally Israel would result in Russia sending thousands of nuclear weapons towards the U.S. and the U.S. responding in kind. Not surprisingly, no nation state has attempted to attack Israel since 1973. A former Israeli official justified Israel’s threats. “You Americans screwed us” in not supporting Israel in its 1956 war with Egypt. “We can still remember the smell of Auschwitz and Treblinka. Next time we’ll take all of you with us.” General Moshe Dayan, a leading promoter of Israel’s nuclear program, has been quoted as saying “Israel must be like a mad dog, too dangerous to bother.” Amos Rubin, an economic adviser to former Prime Minister Yitzhak Shamir, said "If left to its own Israel will have no choice but to fall back on a riskier defense which will endanger itself and the world at large... To enable Israel to abstain from dependence on nuclear arms calls for $2 to 3 billion per year in U.S. aid." In 1977, after a right-wing coalition under Menachen Begin took power, the Israelis began to use the Samson Option not just to deter attack but to allow Israel to “redraw the political map of the Middle East” by expanding hundreds of thousands of Israeli settlers into the West Bank and Gaza. Then-Minister of Defense Ariel Sharon said things like "We are much more important than (Americans) think. We can take the middle east with us whenever we go" and "Arabs may have the oil, but we have the matches." He proclaimed his - and many Likud Party members' - goals of transforming Jordan into a Palestinian state and “transferring” all Palestinian refugees there. A practice known worldwide as "ethnic cleansing." To dissuade the Soviet Union from interfering with its plans, Prime Minister Begin immediately “gave orders to target more Soviet cities” for potential nuclear attack. Its American spy Jonathan Pollard was caught stealing such nuclear targeting information from the U.S. military in 1985. During the next 25 years Israel became more militarily adventurous, bombing Iraq’s under-construction Osirak nuclear reactor in 1981, invading Lebanon to destroy Palestinian refugee camps in 1982 and to fight Hezbollah in 2006, massively bombing civilian targets in the West Bank Jenin refugee camp in 2002 and thoughout Gaza in 2008-2009. There are conflicting reports about whether Israel went on nuclear alert and armed missiles with nuclear weapons during the 1991 Gulf War after Iraq shot conventionally armed scud missiles into it. In 2002, while the United States was building for the 2003 invasion of Iraq, then Prime Minister Ariel Sharon threatened that if Israel was attacked “Israel will react. Is it clear?” Israeli defense analyst Zeev Schiff explained: “Israel could respond with a nuclear retaliation that would eradicate Iraq as a country.” It is believed President Bush gave Sharon the green-light to attack Baghdad in retaliation, including with nuclear weapons, but only if attacks came before the American military invasion. Former Israeli Foreign Minister Shimon Peres has admitted that nuclear weapons are used by Israel for “compellent purposes” - i.e., forcing others to accept Israeli political demands. In 1998 Peres was quoted as saying, "We have built a nuclear option, not in order to have a Hiroshima, but to have an Oslo," referring to imposing a settlement on the Palestinians. In her book Israel’s Sacred Terrorism Livia Rokach documented how Israelis have used religion to justify paramilitary and state terrorism to create and maintain a Jewish State. Two other Israeli retaliation strategies are the popularized phrase “Wrath of God,” the alleged Israeli assassination of those it held responsible for the 1972 killings of Israeli athletes during the Munich Olympics, and the “Dahiya doctrine” of destruction of civilian areas to punish Palestinians for supporting their leaders. Israeli Israel Shahak wrote in 1997: "Israel clearly prepares itself to seek overtly a hegemony over the entire Middle East...without hesitating to use for the purpose all means available, including nuclear ones." Zeev Schiff opined in 1998 that "Off-the-cuff Israeli nuclear threats have become a problem." In 2003 David Hirst noted that “The threatening of wild, irrational violence, in response to political pressure, has been an Israeli impulse from the very earliest days” and called Israel a candidate for “the role of 'nuclear-crazy' state.” Noam Chomsky said of the Samson Option “the craziness of the state is not because the people are insane. Once you pick a policy of choosing expansion over security, that's what you end up getting stuck with.” Efraim Karsh calls the Samson Option the “rationality of pretended irrationality,” but warns that seeming too irrational could encourage other nations to attack Israel in their own defense. Two Israel supporters are frequently quoted for their explicit support of the Samson Option. Martin Van Creveld, a professor of military history at the Hebrew University in Jerusalem, has been quoted as saying: "Most European capitals are targets for our air force....We have the capability to take the world down with us. And I can assure you that that will happen before Israel goes under." In 2002 the Los Angeles Times, published an opinion piece by Louisiana State University professor David Perlmutter in which he wrote: "What would serve the Jew-hating world better in repayment for thousands of years of massacres but a Nuclear Winter. Or invite all those tut-tutting European statesmen and peace activists to join us in the ovens? For the first time in history, a people facing extermination while the world either cackles or looks away--unlike the Armenians, Tibetans, World War II European Jews or Rwandans--have the power to destroy the world. The ultimate justice?" The Israelis also are egged on in its nuclear threats by "Christian Zionists" like Hal Lindsay who believe Israel must expand its control of territory to its Biblical borders in order to bring about Armageddon and the return of Jesus Christ. Some suspect that former President George W. Bush holds such beliefs, especially after his November 2007 statement "If you want to see World War Three, you know, a way to do that is to attack Israel with a nuclear weapon." Israel’s threats to use nuclear weapons, including preemptively, have increased greatly since the revelation in 2002 that Iran was building uranium enrichment facilities. That year Prime Minister Ariel Sharon demanded that the international community target Iran as soon as it was finished dealing with Iraq. Unlike Israel, Iran has accepted supervision of its nuclear program under the Nuclear Nonproliferation Treaty. Iran claims its program is only for production of nuclear power as oil becomes more scarce and expensive, and not for nuclear weapons. However, Israel opposes any challenge to its nuclear hegemony since not only would it be less able to use its nuclear threat to keep confiscated lands, but fear of Iran actually might cause citizens to leave Israel and investment to dry up. Israel also must worry about other “enemy” Arab nations which already are seeking or soon may seek nuclear energy. In 2004 Defense Minister Shaul Mofaz said that Israel would consider "all options" to prevent Iran from producing nuclear weapons. Rumors and warnings of an impending Israeli attack on Iran’s facilities, including possibly with nuclear weapons, have circulated repeatedly since that time. Meanwhile, Israel still considers Russia a target because of its technical assistance to Iran’s nuclear program and its continued arms sales to Iran and other “enemy” nations. In 2007 Israeli officials warned Russia: "We hope they understand that this is a threat that could come back to them as well." Too few peace or political activists, left or right, are willing to challenge Israel’s Samson Option threats or even to make a nuclear free Middle East a central demand. Until military and political leaders, as well as activists, are willing to change U.S. policy of defacto support for Israel’s Samson Option the whole world remains a potential victim of this horrific strategy. Note 1: My comments on the “Samson Option” were quoted in the New York Sun, September 2005. 1. Seymour Hersh, The Samson Option: Israel's Nuclear Arsenal and American Foreign Policy, Random House, 1991, pp. 42, 136-137, 288-289. 2. Avner Cohen, Israel and the Bomb, Columbia University Press, 1998, pp. 2, 7, 341 and Avner Cohen, “Israel's Nuclear Opacity: a Political Genealogy,” published in The Dynamics of Middle East Nuclear Proliferation, pp. 187-212, edited by Steven L. Spiegel, Jennifer D. Kibbe and Elizabeth G. Matthews. Symposium Series, Volume 66, The Edwin Mellen Press, 2001. 3 Avner Cohen, Israel and the Bomb, p. 1-3. 4. Peter Hounam, Woman From Mossad: The Torment of Mordechai Vanunu, Vision Paperbacks, 1999, pp. 155-168. 5. Harold Hough, “Could Israel’s Nuclear Assets Survive a First Strike?” Jane’s Intelligence Review, September, 1997, pp. 407-410. 7. Douglas Frantz, “Israel Adds Fuel to Nuclear Dispute, Officials confirm that the nation can now launch atomic weapons from land, sea and air,” Los Angeles Times, Sunday, October 12, 2003. 8. "Vanunu Confirms Israel's Global Thermonuclear Blackmail," An Interview With Hesham Tillawi, PhD, December 19, 2009. 9. Seymour Hersh, pp. 225-227; Avner Cohen, p. 236 and Mark Gaffney, Dimona, The Third Temple:The Story Behind the Vanunu Revelation, 1989, Amana Books, p. 147. 10. Warner D. Farr, "The Third Temple's Holy of Holies: Israel's Nuclear Weapons." Counterproliferation Paper No. 2, USAF Counterproliferation Center, Air War College, September 1999. 11. Avner Cohen, "The Last Nuclear Moment," The New York Times, 6 October 2003. 12. Federation of American Scientists web page on DEFCON DEFense CONdition. 13. Seymour Hersh, pp. 17, 40, 66, 174-75, 177, 216, 220, 223-231. 16. David Hirst, “The War Game, a controversial view of the current crisis in the Middle East,” The Observer Guardian, September 21, 2003. 17. Mark Gaffney, p. 153. 20. Mark Gaffney, p. 165. 21. Encyclopedia of Orient on Likud Party and Elfi Pallis, "The Likud Party: A Primer," Journal of Palestine Studies, Winter 1992. 22. Seymour Hersh, pp. 288-289. 23. Seymour Hersh, p. 260. 24. Avigdor Haselkorn, The continuing storm: Iraq, poisonous weapons and deterrence, Yale University Press, 1999 131-135. 25. David Eberhart, “Samson Option: Israel's Plan to Prevent Mass Destruction Attacks,” NewsMax.Com, October 16, 2001. 26.Stephen Farrell, Robert Thomson and Danielle Haas, “Attack Iran the day Iraq war ends, demands Israel,” London Times, November 5, 2002. 27. Ross Dunn, “Sharon eyes 'Samson option' against Iraq,” Scotsmann, November 3, 2002. 29. Warner D. Farr online article, op cit. 30. Livia Rokach, Israel’s Sacred Terrorism, Third Edition, Association of Arab American University Graduates,1986. 31. “Operation Wrath of God” article in Wikipedia. 32. “The Dahiya strategy,” including interview with IDF Northern Command Chief Gadi Eisenkot,Yedioth Ahronoth (Ynet News), June 10, 2008. 33. Israel Shahak, Open Secrets: Israeli Nuclear and Foreign Policies, Pluto Press, 1997, p. 2. 34. “United States Information Agency’s Foreign Media Reaction Report, Middle East section, February 4, 1998,” reprinted at GlobalSecurity.org..
35. David Hirst article, op cit. 36. Transcript of Noam Chomsky talk: "Assessing the Role of US Foreign Policy, Israeli Security, & Human Rights in the Occupied Palestinian Territories," April 7, 2009 Madison, WI. Youtube Video of talk. 37. Efraim Karsh, Between war and peace: dilemmas of Israeli security, Routledge, 1996 pp.130-131. 39. David Perlmutter, Opinion Page piece “Israel: Dark Thoughts and Quiet Desperation,” Los Angeles Times, April 7, 2002. 40. Louis Rene Beres, "Israel and Samson. Biblical Insights on Israeli Strategy in the Nuclear Age,” March 22, 3004; Beres, et al. Project Daniel final report; “The world, of course, continues to begrudge the Jewish state: Israel and Palestine, the Samson Option” Canada Free Press, March 31, 2009. Why Israel Can't Wait: The Coming War Between Israel and Iran, Simon and Schuster, p. 101, 2009. 42. Jerome Corsi, Atomic Iran, op cit. 43. See Hal Lindsay on the Samson Option: The Samson Option, July 14, 2007 at StandingWithIsrael.org and “Prophesied destruction of Damascus imminent?”, WorldNetDaily.Com, September 21, 2007. 44. Michael Ortiz Hill, “Mine Eyes Have Seen the Glory: Bush's Armageddon Obsession, Revisited,” Counterpunch.org, January 4, 2003. 45. “Bush defends World War Three comments on Iran,” Reuters, Nov 7, 2007. 46. Stephen Farrell, Robert Thomson and Danielle Haas, “Attack Iran the day Iraq war ends, demands Israel,” London Times, November 5, 2002. 47. Roger Howard, "Why Israel Really Fears Iranian Nukes,” Antiwar.com, November 27, 2004. 48. “Nuclear Shadow over the Middle East,” PalestineChronicle, May 11, 2009. 49. Stuart Reigeluth, “Race to ultimate arms,” Weekly Ahram.org, 14-20 August 2008, Issue No. 910. 50. “Israel Takes Issue With Iran Weapons,” Yahoo News, September 29, 2004. 51. “Israeli Defence Minister Calls For Calm Over Rumoured Attack On Iran Jerusalem,” Agence-France Presse, December 22, 2004. 52. Jason Ditz, “Israel Preparing to Attack Iran Without US Assistance,” Antiwar.com, December 4, 2008. 53. Alan Sabrosky, “Bibi Netanyahu: a Knave of Ghosts and Shadows,” Salem-News.com, October 5, 2009. 54. Michael Jasinski, "Russia's Nuclear and Missile Technology Assistance to Iran; Nasser Karimi, Russian Fuel Ready for Iran," Associated Press, September 16, 2007 and Robert Tait, Mark Tran, “Putin warns US against military action on Iran,” The Guardian, October 16, 2007. 57. Francis Harris, “America would back Israel attack on Iran,” The Telegraph February 18, 2005. 58. Aluf Benn, “Obama's atomic umbrella: U.S. nuclear strike if Iran nukes Israel,” Haaretz, November 12, 2008. 59. Jeffrey Goldberg, “Netanyahu to Obama: Stop Iran—Or I Will,” The Atlantic, March 31, 2009. 60. Michael Theodoulou, “Iran threatens to set Israel ablaze as fears grow of US-backed war,” Scotsman, July 9, 2008. 61. "Iran threatens to strike Israel's nuclear sites if attacked," Daily Star, December 10, 2009. 62. Jason Ditz, “Obama Emphasizes Iran ‘Threat’ on Eve of Netanyahu Visit,” Antiwar.com, May 17, 2009. 63. Jason Ditz, “Netanyahu Leads Calls for Harsh Moves Against Iran,” Antiwar.com, September 24, 2009. 64. Jason Ditz, “Obama: Iran Is on Notice, Won’t Rule Out Military Action,” Antiwar.com, September 25, 2009. 65. Text of Netanyahu speech before the United Nations, September 24, 2009. 66. Stephen J. Sniegoski, “Obama and the Neocon Middle East War Agenda,” Antiwar.com, March 21, 2009. 67. Daniel Luban, “Under Pressure from Hawks, Obama Tacks to the Right,” Inter Press Service, August 12, 2009. 68. Robert Parry, “Is Joe Lieberman Protecting Israel?” originally published in ConsortiumNews.com, December 15, 2009. 69. Stephen M. Walt, “On Afghanistan, Iraq, and the Lobby: A response to Peter Beinart,” ForeignPolicy.com, December 9, 2009. 70. John Steinbach, “Israeli Weapons of Mass Destruction, A Threat to Peace: Israel's Nuclear Arsenal,” GlobalResearch.Ca, March 2002.
for the first time. Lebanon-based Al-Mayadeen TV released new dramatic footage showing Israeli forces using a weaponized drone against a Hamas rally in the Gaza Strip, according to the Times of Israel. "Palestine — (ZH) For the first time, Lebanon-based Al-Mayadeen TV released new dramatic footage showing Israeli forces using a weaponized unmanned aerial vehicle (UAV) against a Hamas rally in the Gaza Strip, according to the Times of Israel. The short video clip published by Al-Mayadeen shows a weaponized unmanned aerial vehicle (UAV) targeting demonstrations in the southern Gaza Strip, controlled by the Palestinian militant group Hamas. The UAV is seen flying through the skies above hundreds of protestors, while operators of the aircraft drop chemical weapons into the crowd. The Times of Israel states that the UAV released tear gas, formally known as a lachrymator agent, which causes severe eye and respiratory pain, skin inflammation, bleeding, and even blindness. Might help to deflect from Gaza murders in cold blood but expect more!! !